Julie Nicklin, the 54-year-old owner of the Smart, stopped to fill her car up with gas this past Friday. She went to the rear quarter, opened a round panel, and proceeded to fill the volume inside with rich, golden gasoline. The only problem is that the particular round panel she chose was not the fuel filler. It was the engine’s air intake port. The fuel filler is on the other side of the car, behind a nearly identical black plastic round access panel. 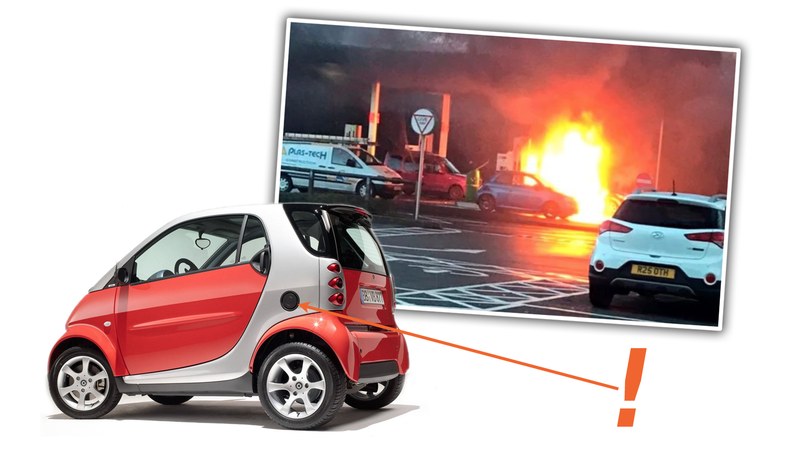 The result of this was that when she got in the car and turned on the ignition, there was an almost immediate explosion, and the interior of the car rapidly filled with flame. Luckily, 54-year-old Brian Turner was nearby, and opened the Smart to drag Nicklin out, who escaped with just scorched clothes and glasses. Almost immediately after exiting the car, the whole gas pump exploded, for a very action-movie type of scenario. Now, sure, I suspect the act of popping off the round center cover from the air intake looks and feels notably different than flipping open the fuel filler door, and you’d think the driver would have noticed something amiss, but, in her defense, these two very, very different intakes do look remarkably and needlessly alike. There’s even a center cap of the plastic air intake that can pop off, sort of like a fuel filler cap. And yes, if you look at the round plastic part itself, there is text molded onto it that reads NO FUEL, but it’s on the back of the part, where no one will ever see it unless they’ve already taken it apart. It’s a bad design. The need for symmetry is pretty questionable when, aside from some sort of horrific accident, you can only see one side of the car at a time, anyway. When there’s such dire consequences from possible confusion, you’d think any attempt to differentiate these two parts should be taken. It’s not like this is a barely known issue, either. People have been complaining about this since at least 2010. Later versions of the Smart ForTwo changed the air intake design to something that actually looks like an air intake, and there are some goofily-fun aftermarket air intakes that solve this problem, but this is just one of those problems that should never have happened in the first place. “If it’ll make the car explode if you put gas in it, don’t make it look like you can put gas in it” should be one of those tenets of auto design that people get cross-stitched into decorative pillows.